Foreign-invested companies in the Korean manufacturing sector have seen their combined R&D investment nearing KRW 2 trillion. According to a survey on foreign-invested companies’ 2011 managerial performance, conducted by the Ministry of Knowledge Economy (MKE), the value of R&D investment by foreign-invested manufacturers surged 40% from KRW 1.33 trillion in 2010 to nearly KRW 1.86 trillion in 2011. Their share of the Korean manufacturing industry also rose from 5.4% to 7.1% during the same period. The survey looked into 1,000 companies, over 10% (over USD 500,000) of which were owned by foreign investors as of the end of 2011. Overall, foreign-invested companies’ contribution to the domestic economy has also been on the rise. As of 2011, the number of employees on their payrolls gained 17,000 year-on-year to 501,000. Noteworthy is that foreign-invested manufacturers led job growth by taking on 22,794 new hires in 2011. Their exports also ticked up USD 8.4 billion to USD 100.7 billion and their sales climbed over 20% year-on-year to KRW 482 trillion in 2011. The key economic driving force behind Park’s administration is based around the convergence of Korean industries with science and ICT. Since her time on the campaign trail, Park Geun-hye has underlined the potential integration of ICT with diverse industries such as service, culture, and electronics to generate a new growth engine for Korea’s economy. The coming Park Geun-hye government is expected to take a two-track policy of promoting exports of nuclear power plants while curbing expansion of the industry at home. The outline of 140 major projects that the presidential transition committee unveiled on Thursday said the new government will support exports of nuclear plants in an attempt to boost the economy. But it didn’t present a clear direction on the increase of nuclear reactors at home. The president-elect has continued to stress the safety of nuclear plants rather than capacity expansion. The renewed nuclear power policy direction was confirmed in the final version of the 6th Basic Plan for Long-Term Electricity Supply and Demand for 2013 to 2027, which the Ministry of Knowledge Economy released on Friday. According to the plan, demand for electricity is expected to increase 3.4 percent on average per year between 2013 and 2027. Based on the prospects of rising demand, the ministry also unveiled plans on increases of electricity generation facilities by energy sources except nuclear power. In February 2008, Kim Woo-sik’s self-esteem as a scientist crumbled with the disbandment of the Ministry of Science and Technology. Likewise, the event instructed by then-incoming President Lee Myung-bak as part of his campaign pledge of creating a “small government” enervated scores of scientists and engineers in the country. Five years on, they are now rebuilding the damaged identity with the revival of the ministry that is bigger and even stronger than five years ago. The newly-created ministry, tentatively named the Ministry of Future Creative Science, is already nicknamed “super” ministry because of extensive roles and responsibilities it will take. But it has triggered concerns about its ability to deal with them without flaws. ‘Super’ ministry Under President Park Geun-hye’s government restructuring plan that is awaiting congressional approval to take effect, the ministry is set to handle almost everything in the fields of natural and applied science, research and information technology that include the nation’s ambitious space program. South Korea’s struggling shipbuilding industry seeks to find breakthroughs with their focus toward green and energy-efficient ships. 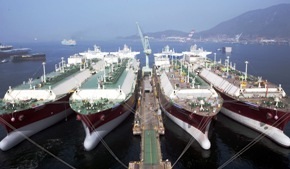 The industry’s winning strategy in the ongoing economic recession came from the market landscape where ship owners shift toward green and energy-efficient ships as a way of cutting fuel costs and environment standards are increasingly enhanced. The nation’s top three shipbuilders including Hyundai Heavy Industries, Samsung Heavy Industries and Daewoo Shipbuilding & Marine Engineering and even mid and large-sized ones including Hyundai Mipo Dockyard and SPP Shipbuilding bet on building eco-friendly ships, according to the shipbuilding industry Monday. The nation’s top three shipbuilders are likely to compete in the race to secure an 18,000 TEU (Twenty-foot equivalent units) container ship order issued by the Middle East-based shipping company United Arab Shipping Company (UASC). The orders are worth a whopping $2 billion in total. 2G phones back with a vengeance? Someone casually pulls out his phone from his pocket during a coffee break in between a series of morning meetings, peers at it for a while before flipping open the lid to start talking into the mouthpiece. Flip phones are usually feature phones, also called second-generation or 2G phones running on the previous second-generation communication networks, and it seemed like their days had been numbered when smartphones hit the Korean landscape several years ago. Currently, up to three-fifths of the Korean population uses smartphones, with computer-like operating systems that run high-tech applications for playing games, finding directions, juggling schedules and anything else designed to make life that much more convenient and entertaining. Yet up to 20 million people in the country still use a feature phone, and are refusing to switch. In fact, many are demanding new designs for their “outdated” phones. “We don’t want to switch to smartphones, but we do want our feature phones to look hipper,” said one blogger who is a member of the blog, “For a united “010.” The mobile prefix “010” is the first used for smartphones, and began use with 2G feature phones in 2004.